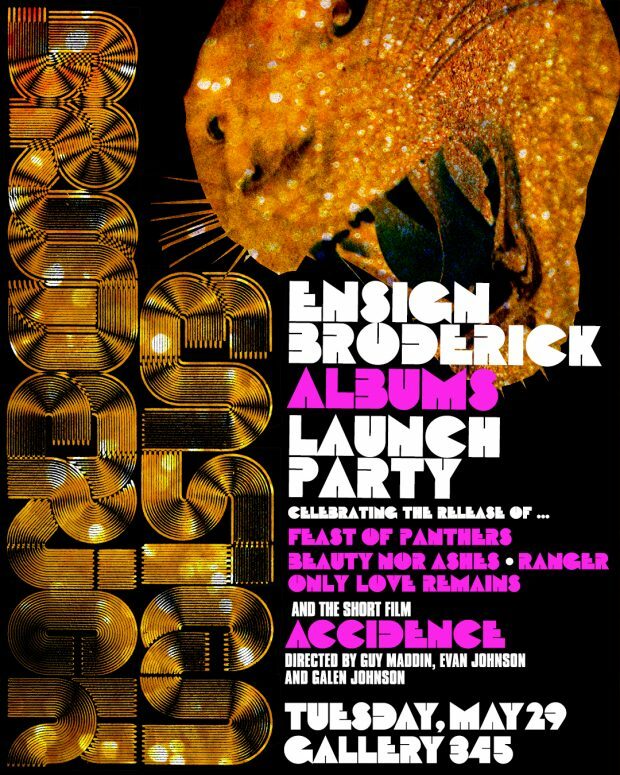 ENSIGN BRODERICK ANNOUNCES ALBUMS RELEASE PARTY ON MAY 29TH IN TORONTO. Please join us as we officially welcome Ensign Broderick to Six Shooter. On May 29, we’re throwing an Albums Release Party at Gallery 345 (345 Sorauren Ave). This special event will celebrate the release of Ensign Broderick’s mind-bogglingly expansive and intertwined first four new albums (with many more to come). Since launching his solo career only six months ago, Ensign Broderick has performed in Tokyo, Vancouver, Toronto, Winnipeg and Austin and premiered a short film, Accidence, directed by Guy Maddin, Evan Johnson and Galen Johnson in Berlin. He’s even had the out-of-body experience of standing in Tower Records Shibuya while listening to radio legend Rodney Bingenheimer spin his new songs from a studio in LA. https://sixshooterrecords.com/2011/wp-content/uploads/2017/11/17-ssr-logo-home.png 0 0 Sarah https://sixshooterrecords.com/2011/wp-content/uploads/2017/11/17-ssr-logo-home.png Sarah2018-05-14 15:40:532018-05-15 15:56:18ENSIGN BRODERICK ANNOUNCES ALBUMS RELEASE PARTY ON MAY 29TH IN TORONTO.